Valentines - Disney Couples Valentines Gift Set (Micky/Minnie, Donald Daisy) Characters are repeats). September - Basketballs-- North Carolina with 50% imprinted with "2009 National Champions" and Ohio State. The Faires european editions joined the collection. One of the most amazing and detailed collectable series ever released - OZ. 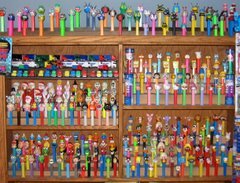 None of these characters have ever been issued by PEZ before nor are they available retail as singles. Another truck to the collection - the Sprint All-Star Race Hauler. That's it for the new acquisitions for 2009.